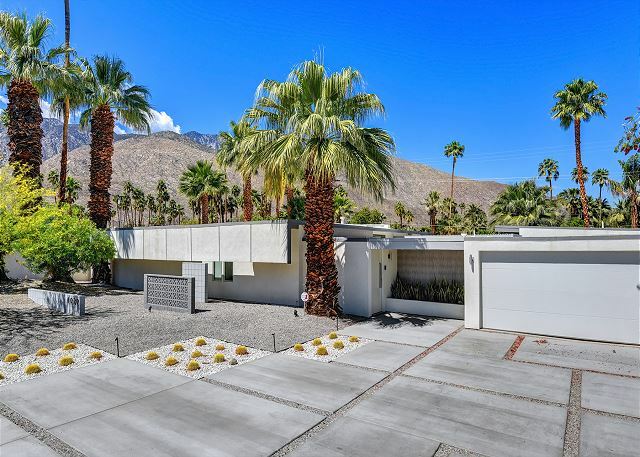 This fabulous mid-century house in the Twin Palms neighborhood of South Palm Springs is rarely available for rentals. Completely remodeled in 2014 by renowned local design firm H3K, this house stays true to it's mid-century heritage while offering all the modern conveniences you expect from a first class vacation rental. Enter the courtyard door into a chic trellised outdoor foyer with bubbling fountain. Once you step into the house through the yellow front door you'll find a light and bright great room with high end furnishings, area rug, and oversized art. No expense has been spared from walls of glass to the gas fireplace to the fully redone gourmet entertaining style kitchen. The kitchen features high-end appliances and a floating island with 2 bar stools. It's open to the living and dining rooms, both filled with natural light and all top of the line design finishes. Step outside to the back yard and you will find a newly redone pool and spa with great sunning areas and sweeping mountain views. With multiple seating and lounging areas, the outdoor dining area seats 6 people and 4 chaise lounges and designer umbrellas line the pool. The fire pit is perfect for enjoying the evening with friends. The master bedroom has a king bed, en suite spa-like bathroom with double shower heads, and flatscreen TV, as well as a private patio. The guest bedroom features a queen bed and has a full bath right across the hall, and also has a flatscreen TV. There is also a den with a small desk, in case you need to slip away to do some work. The detached casita will take your breath away with the comfortable furnishings, amazing mountain views, and oversized bathroom with walk in shower. The largest room in the house, it sits out by the pool and features a wall of sliding glass doors that open to the pool area and wrap around mountains. Complete with a king bed, en suite bathroom, and siting area, this private retreat will make you feel like you're in a hotel suite. If you're looking for a luxury experience with mid-century flair, and only the best will do, this is the house for you! We had a great stay. Everything was as promised. The house was clean and even better than the pictures showed. We had a bit of an issue getting the spa to heat up (user error) and someone came right out to help us fix it. I highly recommend this place for a quiet relaxing getaway. Beautifully furnished and maintained property.Only criticism is that it is on a busier street so you can here some background traffic noise of cars going by when sitting by the pool (none inside). It is by no means a deal breaker but might bother some. Have stayed in other places in PS and this is in the top five. The management company Altamira, is amazing and the staff, especially, Mo went out of their way to make sure we had a good stay. Our 2nd time renting this property, enjoyed our first trip so much we went back 4 weeks later :) Great experience again, had an initial problem with the spa this time although it was promptly sorted for us. Thanks! were frequent altamira vacationers. we dig their homes, service and care. my kid always demands (happily) that we find a new house each time, too. this house, LaVerne was the best we've had. not an issue. totally top drawer. every amenity possible. highly recommend this spot, and any altamira spot. were coming back mid july for a week - evidence its the very best. We had a perfect stay at the Laverne house. Altamira was very helpful and Moe was especially responsive during that holiday weekend. The house was spotless and beautiful. We would love to stay there again! We just got home from a wonderful vacation. Our rental from Altamira was a great house, and dealing with the company, was a pleasure. I wish all rental companies were as friendly and efficient as Altamira. The house was in apretty good location, and kept up very well. We loved the mondernistic decor, sitting out in the back at the pool looking at the mountains, and soaking in the hot tub in the cold evenings. Palm Springs was great to visit. Easy to find your way around, great restaurants, amazing hiking in a very close proximity, and we found public tennis and pickle ball courts both not far away. I would come back again, and without a doubt book with Altamira. Had a great time staying here! Every amenity you could want and very clean. Great location too. As a first time visitor to Palm Springs, I was keen to find the perfect mid-century modern house that would provide the full kitschy experience that every person raves about. I found this listing and have to say, the house is BEYOND amazing! The pictures highlight some of the features and design but the details have to be seen to be appreciated. The lighting, the fireplaces (indoor and outdoor! ), the heated pool with fountain features, the materials, etc are all spectacular. Location-wise, we could not have been happier - you're in a quiet neighborhood but only minutes from all the restaurants and town highlights and the views are ridiculous! Waking up every morning to the sun lighting up the mountains made it so memorable and the entire staff at Altamira made the rental a breeze. I am officially a Palm Springs fan and would rent this house again in a heartbeat! I rented "the LaVerne" for my birthday weekend. The house was spacious and fabulous. Comfortable and luxurious beds, well appointed kitchen, great secure and safe environment. And the pool....the temp was 110 degrees but the pool, spa and outdoor lounge areas kept us cool and able to enjoy the outdoors for the entire day. Palm Springs is always a wonderful time, but this property took it to new heights. Will rent again...soon.